"If we're oppressing ourselves, there's no need to oppress us." On its Twitter account, the Occupy Pittsburgh movement half-jokingly refers to its encampment on Mellon Green as "AmericasMostLivableOccupation." Walking through the camp -- at least on one of the last balmy days Pittsburgh is likely to enjoy this year -- it's easy to see why. Since the Occupation began on Oct. 15, the number of tents on the 1.5-acre site has grown from a few dozen to roughly 100. Guitar-playing Occupiers furnish music; their comrades can often be seen sweeping the parklet's concrete walkways. Thanks to donations, the camp is powered by a gasoline-powered electric generator, a solar panel and a bicycle-powered dynamo. There's an impromptu library, and the portable toilets are flushable. The encampment kitchen is fully stocked with items from canned goods to breakfast cereal. "The support has been overwhelming," says Nico Brilmyer, whom City Paper found tending the kitchen during a morning visit. Not bad for the Pittsburgh chapter of a global movement that opposes economic injustice, and calls for a system that serves "the 99 percent" of humanity rather than the corporate elite. Craig Bethel, a Pittsburgh native who visited the camp after stints Occupying New York City and Washington D.C., says the local camp's infrastructure "has come together ahead of schedule." It can't last forever, of course. Occupy Pittsburgh's Facebook page currently features a discussion about how "people see the movement progressing … throughout the winter months, especially if there is a smaller presence at camp." Participants like Brilmyer say they're in it for the long haul -- "I'll be here until the end," says the CCAC student. But others, like camp part-timer Troy Shelley, aren't so sure. 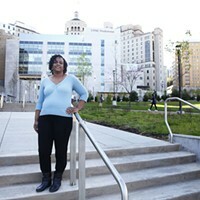 "I'll get killed for saying this," Shelley predicts, "but I think [the occupation will end] when people realize tents won't cut it in the depth of Pittsburgh winters." That's assuming protesters don't drive each other away first. In other cities, the Occupy movement has faced heavy resistance; police have scuttled camps in Oakland, Calif., and arrested protesters all across the country. Here in Pittsburgh, Occupiers must contend with forces beyond the corporate oligarchies they oppose. Like the coming winter. And, sometimes, each other. Taking the Mitts off: Some 30 demonstrators took part in an Oct. 27 Occupy Pittsburgh-affiliated protest at Consol Energy Center, where Republican presidential candidate Mitt Romney was holding a fundraiser. Romney's largest source of contributions, they pointed out, is Wall Street and the financial sector. Before you dismiss the Occupiers as a bunch of unruly hippies, consider this: Nearly a month into the Pittsburgh occupation, city police have not arrested a single participant -- though University of Pittsburgh police arrested one protester during a Nov. 2 demonstration. 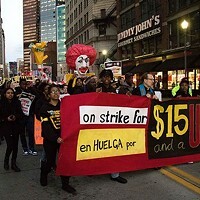 By comparison, last week nine Occupiers in Philadelphia were arrested at a single demonstration. Even smaller cities have seen clashes between protesters and police: On the weekend of Nov. 5 and 6 alone, for example, eight Occupiers in Honolulu were arrested, as were 22 protesters in Worcester, Mass., and 11 in Orlando, Fla.
Those arrests often involved curfew violations, or occupiers' refusal to leave public parks after they were closed. That hasn't happened in Pittsburgh, because Mellon Green is owned by Bank of New York Mellon, which has agreed to let protesters stay indefinitely, provided they maintain the site. But the near-absence of arrests is also "a feather in Occupy Pittsburgh's hat," says Beth Pittinger, who heads the Citizen Police Review Board, the city's independent police-oversight agency. Unlike in Philadelphia, demonstrators haven't sought to block traffic, and from the outset, Occupy Pittsburgh organizers have emphasized non-violence. "The core group continues to adhere to those beliefs," Pittinger says. And though Pittinger has criticized police action during previous protests, she praises their handling of the Occupation. The Nov. 2 Oakland march was called to protest the Oakland, Calif., police raid; Pittinger, who observed it, says she heard "a lot of antagonism directed toward police. But they showed a lot of restraint." Letting the Occupation continue, she adds, "is probably the best way for BNY Mellon and police to hand it: Give them the space to profess their message." Protesters widely suspect that Mellon is simply waiting them out, rather than risk bad publicity by evicting them. And many echo demonstrator Shelley, who feels that Mellon's permission "both hurts us and helps us." On the one hand, it has given the encampment a sense of permanence, which has enabled creature comforts like the library. On the other hand, police overreaction has a way of drawing attention to a cause. And while Occupiers have stayed busy -- they've held protests at PNC Bank, a Mitt Romney fundraiser and BNY Mellon itself, for example -- those actions have generated varying levels of interest. What's more, in the absence of police interference, the Occupiers must police themselves: Signs at each entrance to Mellon Green warn that the area is drug-free, and that "violation means eviction." And while Occupiers have taken pains to reduce tensions with police and the broader community, frustration within the group has been rising. 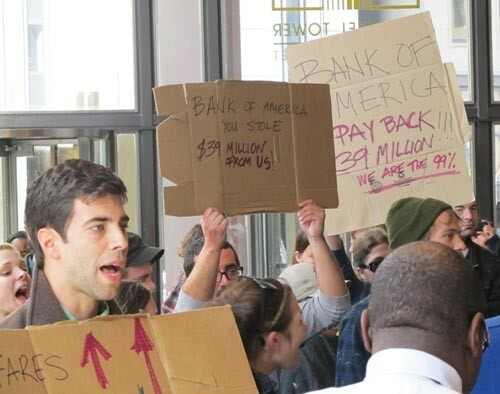 Taking it to the bank: Occupy Pittsburgh took to the streets again Nov. 3, when it protested at the US Steel Tower against a controversial financial transaction, brokered by Merrill Lynch, that cost the Port Authority $39 million. Merrill Lynch was later purchased by Bank of America. The evidence is easy to find, despite the surface quiet on Mellon Green. "There have been tensions within the [Occupy Pittsburgh] camp and there is no consensus on how to resolve those tensions," one recent post by a Facebook page administrator flatly declared. The encampment has witnessed numerous heated exchanges, some of which have spawned flame wars online as well. "Tempers are flaring," acknowledges Brian Paradis, one of the Occupiers. Some tension is inevitable, if only because of sleep deprivation caused by camping overnight Downtown. But disputes about tolerance and inclusivity are also a factor. "This is a movement that claims to speak on behalf of the world," says Amber Kelsie, a member of the movement's Marginalized Communities and Allies Working Group. "But a lot of people being spoken for aren't being recognized" within the movement itself. While observers like Pittinger laud the movement's deference to police, for example, Kelsie says that approach obscures some real divisions. Occupiers are fond of observing that police officers, too, are part of the 99 percent. "But to me, that's trying to say the police are our friends." That may be true for many whites, she says, but "I don't think it's true for everybody." "The camp has had to deal with all the things we deal with in society -- ageism, sexism, homophobia," says Celeste Taylor, a longtime racial-justice activist who recently spent a few nights on the site. Much of the experience impressed her: "To witness the night watch [in which occupiers patrol the camp while others sleep] or the food teams -- it's really something." But that very level of organization can make newcomers feel unwelcome at events like the "general assembly," where Occupiers decide on camp rules and future protests. "If you show up and don't understand how a general assembly works, but you're told to be quiet -- there's a disparate treatment," Taylor says. Those at the Mellon Green tend to be disproportionately white, and while "I haven't heard the n-word, there has been curse words and labeling." Concerns about representation frequently bedevil social movements, says Pete Shell, a longtime activist. Even when whites find themselves in the same boat as long-suffering minorities, they can be too quick to reach for the tiller. "It happens any time whites get together," says Shell, who is white. 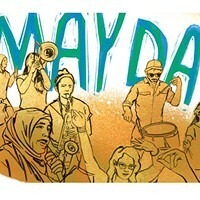 What's more, Occupiers have responsibilities not faced by those who merely organize a traditional rally or march. Although the Occupy Pittsburgh encampment belongs to BNY Mellon, Kelsie says protesters are asserting their own property rights over it: "There's a culture of ‘We have to protect the camp from outside threats,' and I think that's really dangerous." The prohibition on drug use is common at Occupy encampments, and Occupiers here have pressured people into leaving the site for apparent violations of it. That has spawned debate over whether rules are being forced unevenly, with minorities more likely to face eviction. Pittsburgh's encampment, again like those elsewhere, has also attracted some people with substance-abuse and mental-health challenges. And there is disagreement about how to approach those differences as well. "I have seen some damaged, lonely people in camp," says Taylor. While Occupiers have helped refer some to treatment, some see doing so as another form of marginalization. "There are some people who think we can handle everything at the camp," Taylor says. Many Occupiers readily concede that, however unconsciously, everyone carries some of the prejudice found in wider society. But if bad behavior goes unchecked, they worry, it will be used to justify evicting everyone. "We're very sensitive to anything that would jeopardize the movement," says Brilmyer, the camp kitchen volunteer. None of these issues are simple, all sides agree. In many ways, they reflect challenges faced by society as a whole. Kelsie acknowledges that fear of police reprisal is a legitimate concern. Still, she says, some fears have been "blown out of proportion. … If we're oppressing ourselves, there's no need to oppress us." In the hole: Not all protests have drawn much support. 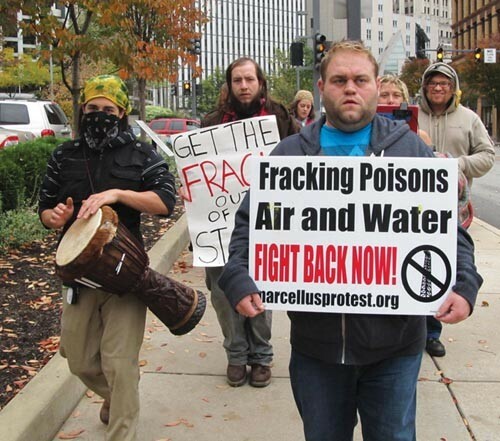 An Oct. 26 march against natural-gas drilling attracted only a dozen protesters to the David L. Lawrence Convention Center. At this point, it would be easy to sigh, "This is why the left never gets anything done." But Shell isn't giving up. He says he and others are launching workshops on racial issues: "We're not going to sit around and say, ‘You're a racist!' but to talk about white privilege" and how to mitigate it. "What's good about this sudden burst of discussion is people are confronting the status quo," Kelsie says. "We have a space in which we can do that, and I hope that the Occupation continues for as long as it takes." Because the Occupation is by definition an ongoing movement, it provides an opportunity for what Kelsie calls "intentional living" -- assessing how your day-to-day life and attitudes square with values like social justice. The Occupation may not merely change society, some hope, but act as a model for it. That won't be easy. "Don't romanticize this movement too much: It's hard," cautions Taylor. But she says, "It's fascinating how this weaves together, because it's about equity in the deepest sense. I feel like I'm where I ought to be. And I'm going to keep showing up."